Because of the Independence Day in the United States, today we will witness a quiet market. The support rests at 1.16340 with resistance at 1.16970 which the weekly pivot point at 1.16440 is located in between the lines. The EMA of 10 is moving with bullish bias in the ascendant channel and it is below the EMA of 200 and above the EMA of 100. The RSI is rising above the 50 level, the Stochastic is moving in high ranges and the MACD line is above the signal line in the positive territory. The ADX is showing a slow buy trend. 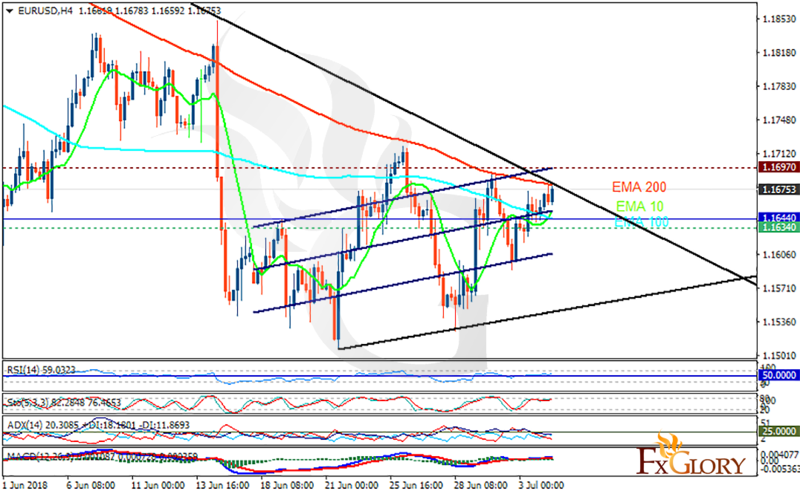 EURUSD will probably fluctuate within the descendant triangle.